I have not read any of Julie Mayhew’s work before and I selected this book as I was dashing to catch a train. First of all, let me make clear that I really liked this novel. I was swept away by the muscular prose, the salty sensuality, the sharp dialogue, the clever characterisation and the philosophical exploration of the question of what love is. By nature I am a dour Northern lass not prone to gushing and have indeed, after a past review, been contacted by an author to ask me if I really liked their book because they weren’t sure. Generally if I post a review of a book it is because I like it. However, I have two quibbles about the Electrical Venus. The cover, which is beautifully illustrated by Suzanne Carpenter, may be too young for the content. Indeed I selected it from the 9-12 section where it had been misplaced. My second quibble is the over use of the ‘F word’ in the text. It was used too many times, was rather gratuitous and began to grate on me. The rest of the writing is sublime and I fear that this over use of one word will limit the marketing of this book which would be a shame. The story is set in Georgian England where a group of characters are trying to scrape a living in a travelling side show. The story is told from the perspective of two characters, Mim and Alex. Their chapters are interspersed with advertising broadsides for the shows, a ballad and a newspaper article, all of which create the atmosphere of Georgian England with its preoccupation with natural philosophy and science. Mim is the daughter of a highborn lady and a West African slave who was sold to the show as a baby. Her best friend is Alex, the one-armed boxing boy. 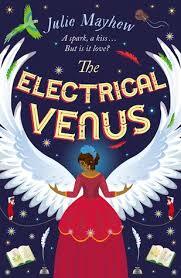 Their lives are changed by the arrival of Dr Fox and his electrickery which transforms Mim into the star turn as the ‘Electric Venus’ where men jostle to pay a penny and receive an electrifying kiss from her lips. But is Mim’s transformation a measure of her real worth? Is there a better future awaiting her if she can shape her own destiny?